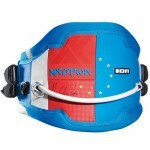 Ion Madtrixx is a freestyle harness with a slim outline. 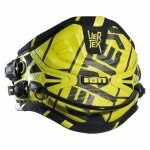 Thanks to the Elasto tec cutout construction the backpart of the harness provides a maximum of flexibility. 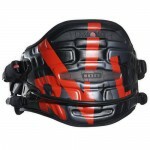 Inside protection with full neopren cushion lets the harness twist easily around the body when needed. 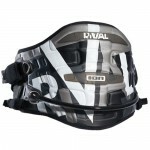 The neoprene surface includes now an Anti-ride up profile, which prevents the harness from slipping up. With the new Contour shape 2.0 the harness creates an even bettersupport than before. 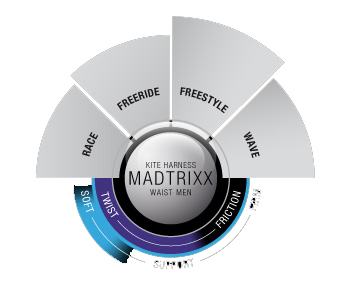 The Wrap tec and pre bent guarantees a perfect overall fit. - Hip Protection -The double layer foam padding protects your bones and all other vulnerable parts in this area.Especially if the body is bend sideways. - Cross Link Webbing - Normally the webbing belt ends somewhere behind the buckle. We found that a continous webbing belt along the back of the harness spreads the load much better. 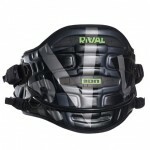 This guarantees better force distribution around the back of the harness. 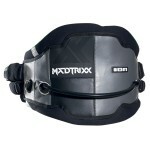 - Internal Flex Belt - Flexible waist belt with rubber endings to ensure tight and comfortable fit. - Handle Pass Leash Slider - A small metal ring on a rubber coated hande lets the leash slide along the back of the harness, making hanlde pass tricks easier. - Push Button Spreader Bar - The push button supports the quick assembly of the harness. There is no need to mount any velcro tapes through buckels. Just hook the metal ring into the spreader, adjust the webbing and off you go. - Belt Garage 2.0 - Neoprene pockets over the buckles to store away the webbing endings. - Protection Pad - This is a solid neoprene padded plate that keeps away the harness hook from your body. Especially when the spreader bar moves up quickly. - Bar Keeper Belt - The strap construction prevents the spreader bar from rushing upwards in overpowered situations. Two webbing straps run from the bungee belt to the spreader bar to make sure that the kiter doesn‘t get hurt. - Contour Shape 2.0 - New shape technique which provides a perfect fit to the upper and lower part of the back with the help of different segmented shaped areas in the harness body. - Soft Edge - Soft neoprene edge around the harness body. - Elasto Tec - Flexible cutouts in waistharnesses to provide a maximum on flexibility in the backpart of the harness. - Support Cushion - Neoprene cusion inside for a soft and comfortable support of the riders back. 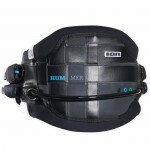 - Wrap Tec - Preshaped harness construction which makes the harness automatically wrap arround the body. - Twister - Neoprene inside construction to let the harness twist arround the body especially when its worn without a wetsuit or top. - Kite Knife - Safety knife to cut the kitelines in dangerous situations.